The herb garden has been an important part of Japanese culture for thousands of years. Today, when we hear “herb” we tend to think of the spices we sprinkle on our food for flavor. However, Japanese herb plants usually have both culinary and medicinal value. Centuries ago, you could not run to the local clinic to treat illnesses, so these things were treated at home with fresh herbs from the garden. Continue reading to learn how to grow Japanese herbs in your own garden. You just may discover that you already are growing some traditional Japanese herbs and spices. Up until the 1970’s, plant imports were not very regulated. Because of this, for centuries immigrants to the U.S. from other countries, such as Japan, usually brought with them seeds or live plants of their favorite culinary and medicinal herbs. Some of these plants thrived all too well and became invasive, while others struggled and died in their new environment. In other cases, the early American immigrants realized that some of the same herbs already grew here. Though today these things are much more regulated by government agencies, you can still create a Japanese herb garden no matter where you live. The traditional Japanese herb garden, like the potagers of Europe, were placed close to the home. This was planned so that one could simply walk out the kitchen door and snip off some fresh herbs for cooking or medicinal use. Japanese herb gardens consisted of fruits, vegetables, ornamentals, and, of course, culinary and medicinal Japanese herbs and spices. Like any herb garden, plants could be found in garden beds as well as in pots. Japanese herb gardens were laid out to not only be useful, but to also be aesthetically pleasing to all the senses. Shiso (Perilla fructescens) – Shiso is also known as Japanese basil. Both its growth habit and herbal uses are very similar to basil. Shiso is used at almost all stages. The sprouts are used as garnish, the large mature leaves are used whole as wraps or shredded for garnish, and the flower buds are pickled for a favorite Japanese treat called hojiso. Shiso comes in two forms: green and red. Mizuna (Brassica rapa var. niposinica) – Mizuna is a Japanese mustard green that is used in the same way as arugula. It adds a mildly peppery taste to dishes. The stalks are also pickled. Mizuna is a small leafy vegetable that grows best in shade to part shade and can be used in container gardens. Mitsuba (Cryptotaenia japonica) – Also known as Japanese parsley, although all parts of the plant are edible, its leaves are most commonly used as a garnish. Wasabina (Brassica juncea) – Another Japanese mustard green that adds a spicy flavor to dishes is wasabina. 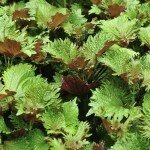 The tender young leaves are eaten fresh in salads or used in soups, stir fries or stews. It is used like spinach. Hawk Claw chili pepper (Capsicum annuum) – Grown as an ornamental pepper worldwide, in Japan, Hawk Claw chili peppers are known as Takanotsume and are an important ingredient in noodle dishes and soups. The claw-shaped chili peppers are very spicy. They are usually dried and ground before using. Gobo/Burdock root (Arctium lappa) – In the U.S., burdock is usually treated like a nuisance weed. However, in other countries, including Japan, burdock has highly prized as a valuable food source and medicinal herb. Its starchy root is chock full of vitamins and is used much like a potato. The young flower stalks are also used like artichoke. Negi (Allium fistulosum) – Also known as Welsh onion, Negi is a member of the onion family that is traditionally used like scallions in many Japanese dishes. 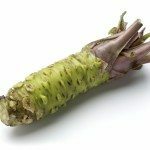 Wasabi (Wasibi japonica “Daruma”) – Wasabi is a form of green horseradish. Its thick root is made into the traditional, spicy paste commonly found in Japanese recipes.